These animals are not overpopulated, they are not threatening anyone’s safety, and they are not threatening their habitat or the existence of any other species. They are killed by the millions simply because hunters get a kick from being violent toward helpless animals. It’s a shame that some within the hunting community have made a columnist so uncomfortable that he felt the need to apologize for voicing his opinion and exercising his freedom of speech. So on behalf of our members and supporters throughout Georgia and the United States, we support Mr. Josh Briggs and his personal views on the needlessly violent sport of hunting. The first thing you will hear from hunters and their apologists is something like “There are too many deer.” While that is true, it is by design. The state hunting agency crafts hunting seasons and kill limits to provide sport hunters with a steady overpopulation of wildlife to slaughter. Since hunters fund the budgets of every state hunting agency through their purchases of hunting permits, weapons, ammunition and hunting equipment, the primary purpose of sport hunting is to keep hunters happy and interested in the sport. 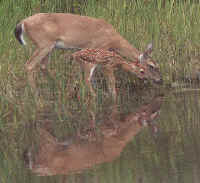 If wildlife populations were actually reduced, hunters would quickly lose interest and the DNR would lose its funding. It’s easy to moan about the deer population but it is much harder to justify killing rabbits, squirrels, turkeys, quail, and other small animals. These animals are not overpopulated, they are not threatening anyone’s safety, and they are not threatening their habitat or the existence of any other species. They are killed by the millions simply because hunters get a kick from being violent toward helpless animals. If hunting were all about enjoying the outdoors, they could get their fill through peaceful and humane forms of recreation such as camping, hiking, wildlife watching and photography. If they loved the outdoors more than they loved violence, shooting wildlife with a camera would satisfy them. As Mr. Briggs said in his column, “taking a life should only be done out of necessity,” and since sport hunting is unnecessary in every instance, there is no way to justify the existence of such a perverted, violent and disgraceful sport. To learn what you can do to hasten the inevitable demise of sport hunting, visit Abolish Sport Hunting.